I've been working diligently to lure birds to our backyard with seed and suet. The persistence seems to finally be paying off. Apparently, enough prey is present to attract the neighborhood Cooper's hawk. The bird alighted on our neighbor's Siberian Elm, above some already flowering silver maples, as Megan, Weston, and I were enjoying Saturday's 70 degree weather. Since I shot this picture right in my backyard while sitting on my deck with my new family, I thought it would make a great contribution to the "My Word" Meme. Go here to participate and view other images. I love it when hawks come to my feeders for prey. They are not often successful (or I probably wouldn't like it so much), but it's nice to get a good look at them. How enjoyable to sit on the deck with the new family in warm weather! Tom: That is really neat to catch him so close. Was the baby outside, I know the weather warmed up? You are the one who told me about the Triangle Lake Bog, thank you. What a great shot! 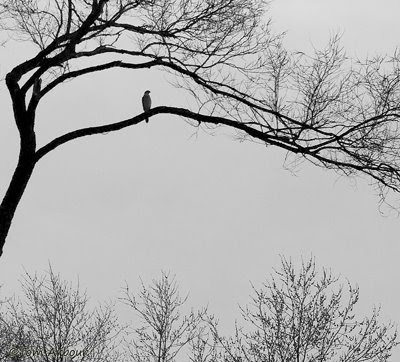 Beautiful, stark tree against the sky really shows off the hawk! Thanks for sharing! Oh you have some neighbor. My neighbors are mostly blue jays and little birds I cannot identify. Glad you shared. Good for you, Tom! Great photo. sounds like you may have a new regular visitor. I'm so jealous! We've yet to see even one hawk on Our Little Acre, though we see them regularly all around us. No Cooper's Hawks yet, though. I'm certain they're here, they just haven't come within our line of vision. We certainly have plenty of "food" for them. Very cool.....a Cooper's Hawk watching over Your World! Great photo of the hawk, I love how your framed this pic. I made my first fat feeders this year and boy did it work, but I've never had hawks in this garden. Lucky you envious me. Glad that your finally getting birds to come, you know i did that once and the birds i got made such a mess in the yard you couldn't even sit out there, have you ever smelled a chicken coop, i think we got those starlings who i have heard are very messy.Maybe i was using the wrong kind of bird seed.I would love to attract birds. Great picture. It must be lovely to live around so much wildlife. welcome to your visitors, and the weather, and much more joys! It looks so comfortable and confident watching over the world. 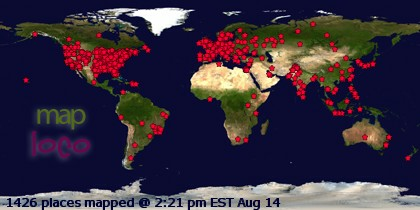 Thanks for visiting my blog...now I am checking yours out..
Congratulations for the new member of your family. Mummy and baby are adorable. Are you with the camera on hands all the time? I was. I have thousands of baby photos. Great shot, loved it! That hawk seemed to be watching over you. Perfect silhouette of the hawk! Great shot and good that your persistence has been rewarded. It took me a long time but now they come two or three times a day and sometimes they scare me half to death when they stay close to the ground then rise up and follow the roof and down the other side and are on top of you before they know it or I know it. A sound no bird wants to hear and probably the last sound most hear. I really like the hawks. I have several thousand photos of them now and some I have never even looked at. Patty and I looked at our storage computer and found almost 79,000 images. I think we have over 3,000 hawks. It has been an ongoing education for me and I am sure photography works for a lot of people like that. I just noticed the grackles are back and each day we see a few more. No thrashers, grosbeaks, towhees, or orioles yet but they are on their way too. I hope and pray I will be able to get outside and take some photos this summer. Glad you and your family could enjoy some wonderful, spring-like weather. The hawk is an added bonus. Doesn't he look commanding!! I guess it's a he. Thanks everyone for your kind and interesting comments. The "my world" meme is really great, isn't it? This is the first year I put a feeder out in the back yard and I've been getting tons of birds. A few weeks ago I was standing out by it taking photographs when a sharp shinned hawk came down and tried to grab a songbird while I was standing there. It didn't get one but man talk about freaking out all the little birds, they disappeared for an hour. I think it's been hanging around most of the winter. Terrific photo. Amazing composition. I'm a real sucker for interesting trees, and this combination with the addition of the bird won me over instantly.